Have you ever wondered how accurate the measurement of your temperature actually is? And I don't mean the accuracy of your thermometer; most of the thermometers you can buy nowadays are accurate to less than 0.1 degree celsius. Imagine that you just had a nice cool drink from your mother but a few minutes later she wants to take your temperature AGAIN. BEEP! Ok, lets see. Well, this looks rather good. Much less than this morning! Good boy (or girl)! Keep at it! Well, it COULD be that the things you've devoured right before the measurement might have an influence to the local temperature in your mouth. Why not? 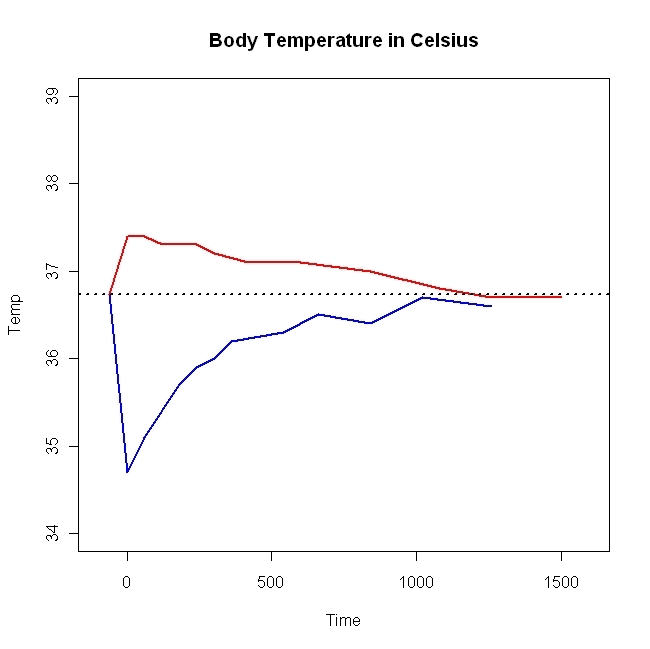 After all we all know that things can be heated up and then will cool down following a negative exponential curve. To clarify this lets do a little experiment. The following graph shows my temperature take in intervals after having a piece of hot apple pie (red) and after half a glas of icewater (blue). The dotted horizontal line represents my average temperature taken four times right before the experiments. As you can see the temperature sharply jumps +0.7 (red) and -2.0 (blue) degrees right after the intake of warm and cold substances respectively. After that it takes a rather long delay (about 1000sec) until the temperature returns to the average value. Lets call this effect the STE effect (Schiel Temperature Error) for now. (since both curves return to the average at about the same time). the time constant tau for both curves is about about 200sec (when the temperature de-/increased 37%). If we want to achieve reliable measurements, it follows that deviations caused by prior intake of food or beverages should not influence the measurement more than the assumed accuracy of the thermometer itself. Most manufacturers claim that their thermometers are exact to less than 0.05 degrees celsius (not taking into account all the errors that may be caused by inproper placement). 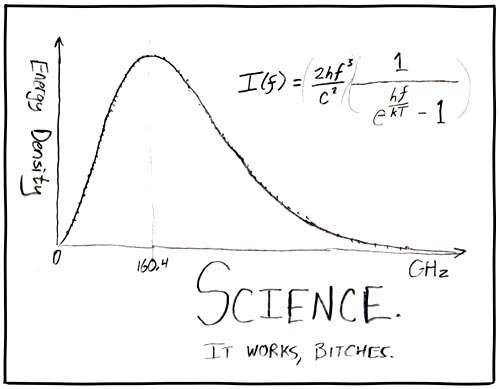 So, lets say the maximum error we allow due to the STE effect should be +/- 0.05 degrees celsius. (I doubt that we can actually achieve that; at least not on the warm side!). From the observed SET effect it follows deductively that Moms should always allow a time period of at least 818 seconds after any food or beverage intake before taking the temperature. Have you ever been checked for alcoholic intoxication? Usually the law officer asks you (more or less politely) to give a good blow into a tube connected to a so called alcotester device ('alcotest' is the trademark of Dräger Savety). This mysterious device measures the concentration of evaporated ethanol (BRAC) and based on that value tries to estimate the corresponding blood alcohol concentration (BAC). The basic idea is that the breath of an intoxicated person contains evaporated ethanol transmitted through the mucuos membranes of the respiratory system. The BAC is considered to be in relation to the measured BRAC. Manufactorers of alcotester devices claim that these show an accuracy of +/-5%, but this does not mean the accuracy of the resulting BAC but the accuracy regarding the BRAC. There remains the problem whether the relationship between BRAC and BAC may be distorted by other factors. A major factor is alcohol that remains in the mouth after consumation which consequently increases the BRAC considerably. Therefore an alcotester must not be used before a minimum waiting period of 20min after the last alcohol intake. If this period is not maintained the results are not admissibly at court (in most cases not even after that, depending on your judical system). Another possible factor might be other substances that influence the used detector, mainly medicamentation (drops) containing ethanol or asthma sprays, but lets keep that on the side for the moment. Finally there are the known factors gender and age (which is why modern alcotester consider these values) and the factor weight or height (which influences the lung capacity and therefore the required amount of breath). So, the basic question here is: What are the chances that the alcotester reports a significant BRAC value while in reality you're totally sober but happens to be lightly build, or female, or a senior, or ... ? I went to several Bavarian beer parties during the last decade and asked folks there whether they would be willing to assist science by donating a blood sample. A law officer (who happens to be a buddy of mine) brought one of these professional alcotesters and took a measurement from all volunteers, while a real (and sober) doctor (who happens to be another ...) took a blood sample right after the breath alcohol test. Of course we also registered age, gender, height and weight (and for the attractive female participants we also asked for the phone number; just in case). For several legal reasons to complicated to explain here, I cannot present the results here on a public web page, but I can give you some interesting results.